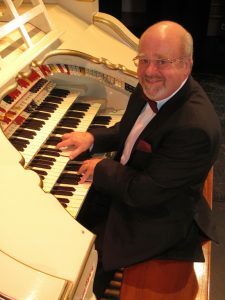 Howard Beaumont, international recording and concert organist, was born in Halifax, Yorkshire. At the age of seven he commenced with piano tuition, later graduating to the organ. Howard learnt the art of demonstrating organs during the late 60’s from the late Jerry Allan, Bill Skidmore and Harold Smart. He soon turned fully professional and toured the country in Cabaret. He later entertained passengers aboard Luxury Cruise Liners in the U.S.A. and, whilst in America, he discovered a new interest in the form of the mighty Wurlitzer theatre Organ at Radio City Music Hall in New York. Upon his return to this country, Howard expanded his talents by playing these great organs in various locations around the country, including the famous Wurlitzer Organ at Blackpool Tower. In addition to Concert dates he is frequently engaged by various electronic organ manufacturers to give promotional demonstrations and, with an uncanny ability to obtain the best from any instrument, he is an ideal choice for this kind of work. 1989 proved to be an important year for Howard as he was appointed resident organist at the Scarborough Spa Park complex where, each summer season, he entertains countless holiday makers in the Sun court. He is regularly featured on the popular BBC Radio 2 programme ‘The Organist Entertains’ and has made over 25 recordings.